Product design, marketing, supply chain, fulfillment and aftermarket service can all be part of the Channel Management relationship. Companies spend time in process management, but with the channels, it's an afterthought. For most firms, channel management ‘just happens.’ It grows up like a poorly tended garden, with both desirable plants and weeds. We recently received an invitation to a workshop on channel management, in which channel managers were called ‘middlemen’ and stating that you could run a successful channel management program with no budget. Having been on both sides of the channel management experience, I was offended by this language, as well as the concept. Your channel partners are only the front line to the customer, and are the carriers of your brand! As such, some care should go into the design of these relationships so that you both get the stellar outcomes you desire, and customers are not confused, frustrated and angered by poor alignment in the channel. In Part One we discussed the need to be inclusive with Channel partners for mutual employee management, recruiting, training and retaining top talent, and working together to build a collaborative team. In Part Two we discussed working with Channel partners to improve forecasting. Here in Part Three we are providing some insights on how to architect this critical relationship. Although not all elements of a strategy can or should be put in place at the outset of a new relationship (investment should match results), understanding and deliberate Architecting of a Channel Management strategy can make your channel management program a success, and help you avoid costly disappointments along the way. Many types of structures can exist for a firm, and they will probably be uncovered by deep discussions with partner candidates. Today the Federated Model is driving most manufacturers’ thinking. What is the economic structure of my market and who are the players who can best support my goals for growth and customer care? Brand, quality, sales and risk reduction all are key issues in architecting and assembling a partner network. Today firms live in an outsourced world, so firms have a diversity of forms and types of partnerships. They also require web-integrated systems and services to glue it all together. It is critical to walk through the business models of your partners and how you will work together before forging contacts. But also, you need to discuss what kinds of mutual systems and processes will be required to enrich the mutual performance of the partnership. Let’s walk through a simplified example which is an extract from some of the work we have done with some of our clients that sell both components and finished products across the globe. In Figure 2 we have compared four partners and their agreements with the company. As with many companies, they have a diverse set of partners who have their own unique capabilities and are only prepared to sell certain products of the company in certain markets. The key is in talking to your partners and understanding their capabilities and your needs. Many companies don’t think deeply about their own needs, and therefore wind up turning on and turning off channel programs rather capriciously, to their own detriment. When we start working with some companies, this simple mapping is usually not available, and it takes meetings with sales, supply chain/distribution and marketing to construct the map. Marketing knows what collateral, what shows, and what joint investments might have been made in these; and sales knows what the ‘deal’ is—are they buying and holding our stuff at discount, or are we shipping on consignment? Are we in the deal with them as a technical partner; and who is sourcing leads to whom? The service team might be wired in to the partner’s real capabilities in knowing the products, as well as aftermarket issues in the channel and the end customer. Once you have a good view into the complexity and uniqueness of the partner’s capabilities, building the right processes, supported by systems, is a must. Scaling and managing all the detail in the relationships just requires transparent, open, and collaborative sharing of information. I am being slightly redundant here, but too many channel relationships go sour due to poor information and lack of transparent practices. 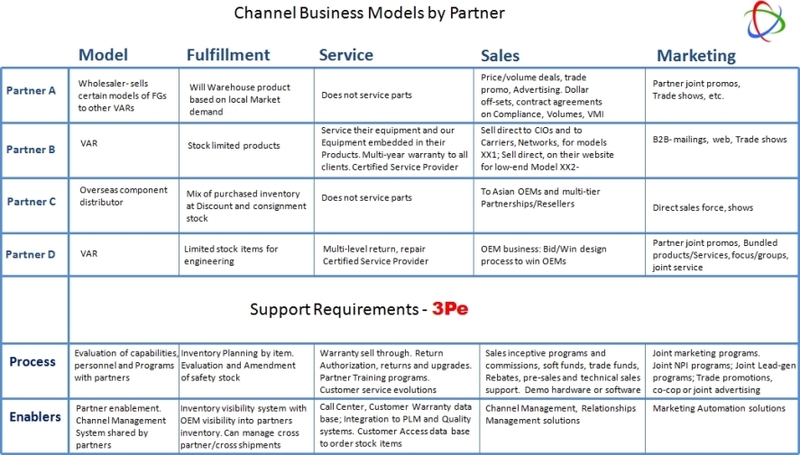 We used our 3Pe™ to model and map the channel arrangements, process and system enablers to the programs and partners. The mapping exercise is easy (see Figure 3). The implementation, though, requires both a good software platform and a realistic roadmap to implement processes and systems in a value-based approach. Taking some time to model out your business should not be a bureaucratic exercise, but rather one that uncovers new business opportunities for growth, for process improvements, etc. We found that in doing these exercises companies could point to better control of their programs, better partner enthusiasm, and commitment to represent the products and more sales. Seems worth it for a few days of work! Don’t Forget the Supply Chain! Models of your supply chain are critical knowledge that the firms should have (read Mapping the End to End Supply Chain) for understanding the trading partner network. 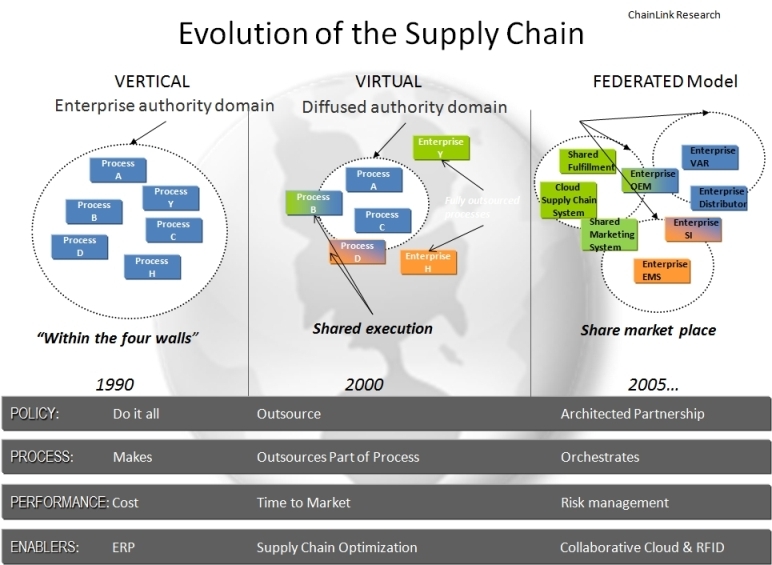 Supply Chain management is a critical element of successful Channel Management. Critical linkages from product planning, NPI (New Product Introduction), inventory planning and distribution of that inventory, unique packaging, through to service maintenance, repairs, and returns, all need to be managed in these relationships. Good supply chain systems can isolate partner activities and requirements, plus provide the needed integration for cooperative management of the customers. These issues become really critical in such sectors as medical devices and equipment where certification, compliance and accurate record keeping by the channel partner to install and maintain medical equipment are required. Channel Management with panache, for the right companies and products, is not new. But in the current economy, companies are loathe to hire new employees without a rapid ROI on that hire. Great training programs certainly come into play here. (Read Part One on Channel Management). Support structures-software to scale, is a good idea. SaaS and MaaS solutions are an investment that should be considered. On Demand solutions such as marketing automation platforms might be good ways to kickstart these programs. In addition, sales performance or channel management software can help manage the plethora of financing, incentives and performance measures that are part of the sales programs. There are domain leading channel management/sales solutions that can address this. Alignment of goals is ultra critical in the channel game. Incentives aside, they represent margin erosions. So much focus in many programs (though we know the practice won’t go away) on these intricate agreements masks the real game—sales and service! 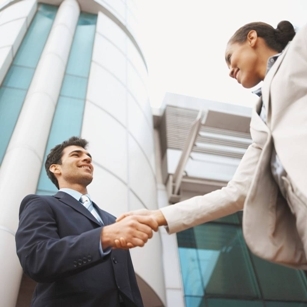 Great brands and great partners can walk away from those incentive programs. Some of our clients don’t practice these, since they have great products to sell and great partner programs, and the revenue share model works. We have seen a lot of companies simplify their channel programs by reducing administration complexity. Capabilities-based approaches on what is being brought to the marriage would be a good idea to include in the analysis and creation of ‘the deal.’ Some partners can bring lots of leads and less closure. Do you really want to eject that partner, or coach them? Most partners are more interested in training, joint marketing activities, and a fair share. Power games amongst the channel partners again masks the real outcome that we all want—growth.